Video started, shows it&'s playing, but you can only hear the audio, no picture. The video playback is stuck at 0, will not progress, will not begin. Black screen with no playback, audio works but no video in full screen. You can see video in the main window but not when in full screen mode. Above issues in mainly caused by hardware accelerating issues. 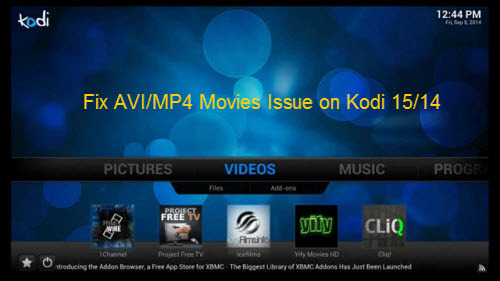 Since from Kodi version 15 and later, Kodi will no longer ask to fix incorrect video decoding permissions on devices that have incorrectly configured firmware, therefore, the best solution here is transcode MP4/AVI to Kodi 15/14 best compatible H.264 HD video codec and AAC audio codec for playback. To finish the conversion, here we would like to recommend you a simple to use application called Pavtube Video Converter for Windows/Mac, as a powerful Kodi video conversion application, the program can do you a great favor to convert not only AVI, MP4 but also other video movies formats such as Tivo, H.265 MVC, H.2564 MVC, etc to Kodi 15/14 best supported file formats for smooth playback. Before adding MP4/AVI movies to Kodi, you can do some simple video editing work to enhance your video viewing experience with Kodi 15/14. 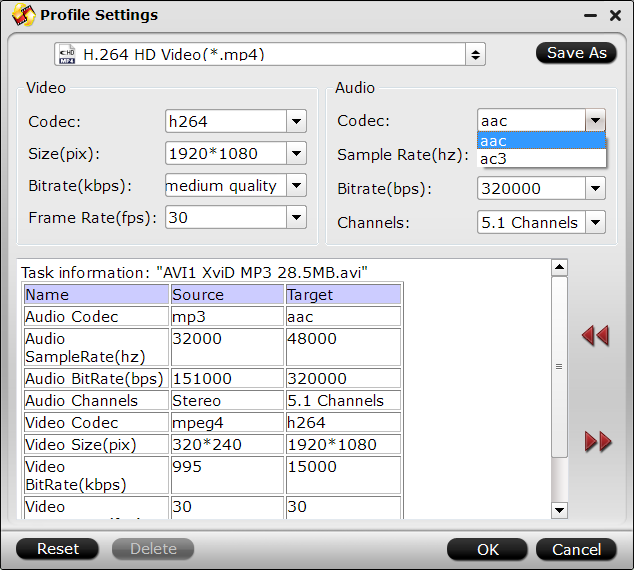 You can trim AVI/MP4 movies to remove unwanted parts, crop video file size to remove the black bars around the video, merge separate video clips into one, apply special color effect or add external subtitles to MP4/AVI videos. How to convert AVI/MP4 Movies for Better Playback on Kodi 15/14? Step 1: Import AVI/MP4 Movies files. 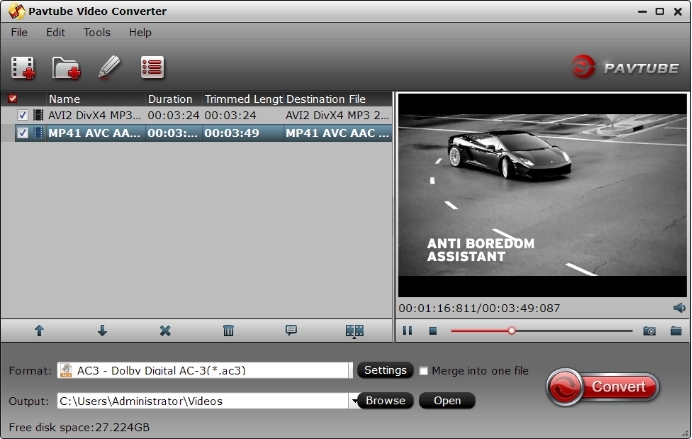 Launch the application on your computer, click "File" > "Load Video/Audio" or "Load from Folder" to import AVI/MP4 Movies files to the program. Step 2: Choose proper format to watch AVI/MP4 files on Kodi. 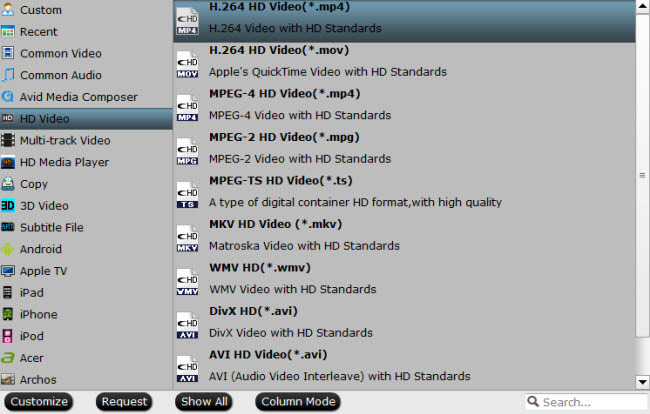 Click "Format" bar, from its drop-down option, select to output Kodi best playable video formats by following "HD Video" > "H.264 HD Video(*.mp4)". Step 3: Customize to output Kodi playable audio codec. Click "Settings" to open "Profile" settings window, in "Audio" section, click "Codec" drop-down list, select Kodi playable AAC codec to output. 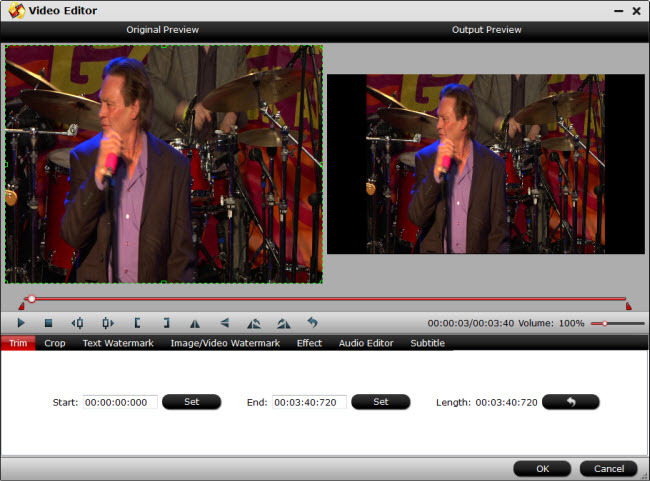 Step 4: Edit AVI/MP4 movies. Go back to the main UI and click "Convert"button to start AVI/MP4 to Kodi 15/14 supported file format conversion process. After the conversion, if you own an Android TV, you can install Kodi on Android TV for watching AVI/MP4 movies on your large screen Android TV with Kodi&'s beautiful interface.